NASHVILLE, Tenn.—On the heels of last year’s blockbuster Newsboys United reunion tour and the current hit single, “Greatness Of Our God,” Christian music supergroup Newsboys is set to unveil their latest FairTrade Services set May 10. 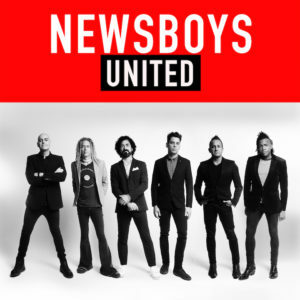 United, the groundbreaking recording bringing together former members Peter Furler and Phil Joel with Michael Tait, Duncan Phillips, Jeff Frankenstein and Jody Davis, was produced by Furler and Geoff Duncan. Furler—a driving force behind such iconic Newsboys hits as “He Reigns,” “Entertaining Angels” and “Shine”—also co-wrote four of the album’s 10 selections. United is available for preorder beginning today with four instant-grat tracks. Hit single “Greatness Of Our God” as well as “Symphony” and the Furler co-penned “This I Know” are immediately accessible, while “Only The Son (Yeshua),” also co-written by Furler, will be available April 26. The project’s lead single, “Greatness Of Our God,” is a triumphant worship celebration bridging the band’s past and present with Furler and Tait on lead vocals. Penned by Colby Wedgeworth, Bryan Fowler and Ethan Hulse, in one month the song has been added across the KLOVE network and Sirius/XM The Message, in addition to Dallas’ KLTY, The FISH Los Angeles and Atlanta, and KTIS Minneapolis, alongside numerous other leading stations. “Greatness Of Our God” is already a Top 20 hit on Billboard’s National Christian Audience chart, Mediabase’s Christian Audience chart, and the Billboard AC Monitored chart, among others. Further highlights of United include current digital single “Symphony,” now available at streaming platforms; as well as “Love One Another,” co-written by Furler and featuring guest vocals from former dcTalk member Kevin Max; the worshipful “Set Me Ablaze,” written by Mia Fieldes, Bryan & Katie Torwalt and Jacob Sooter; and the Michael Tait co-penned album closer, “Never Too Far Away.” A digital deluxe edition of United will also bow May 10, featuring Newsboys’ powerful 2017 anthem, “The Cross Has The Final Word,” and “Rejoice,” a new selection penned by Furler and Steve Taylor. The United deluxe edition also includes remixes of “Greatness Of Our God” and “Only The Son (Yeshua),” as well as “United: The Story Behind The Album,” an exclusive interview with Furler and Tait. Newsboys United have played more than 100 shows together since reuniting and are wrapping their headlining role on the 43-city Winter Jam Tour Spectacular this weekend. In addition, the band is set to join forces with multi-Platinum®, multi-GRAMMY®-winning singer/songwriter Michael W. Smith for this spring’s “Surrounded & United: The Tour.” The 10-city outing will be a night of worship featuring hits spanning both artists’ unparalleled careers.